The college town of Greeley is home to the University of Northern Colorado, among others. It is located on the Front Range of Colorado, about 50 miles north and east of Denver. The city was originally a Utopian experiment called Union Colony, started as a movement based on religion, temperance, and agriculture. The name was later changed to Greeley in honor of Horace Greeley, who popularized the phrase "Go West, young man." The population is just under 100,000. It is the county seat of Weld County. It is near the spot of Fort Latham, the headquarters of the government troops during the Indian troubles of 1860-64 and an important stagecoach stop and waypoint on the Overland Trail. 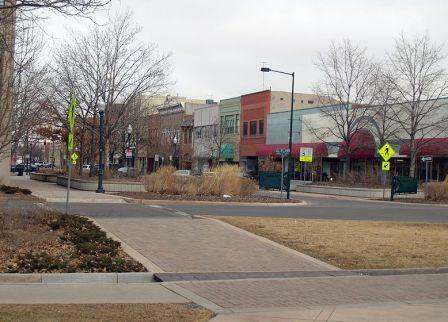 Photo of downtown Greeley in winter courtesy of Wikipedia and David Shankbone.